Gain more exposure for your organization before the fair by taking out a web banner or a home page feature article www.studyandgoabroad.com, our student website. www.studyandgoabroad.com offers students a ‘one stop shop’ reference for fresh and up-to-date information on post-secondary studies abroad, as well as experiential travel and Gap Year options. The website is also the main source of information for students who are looking to attend the fall or spring Study and Go Abroad Fairs, and our extensive marketing and advertising campaigns drive traffic to this site. In fair season, we would expect around 48,000 unique visitors per month and over 260,000 page views. 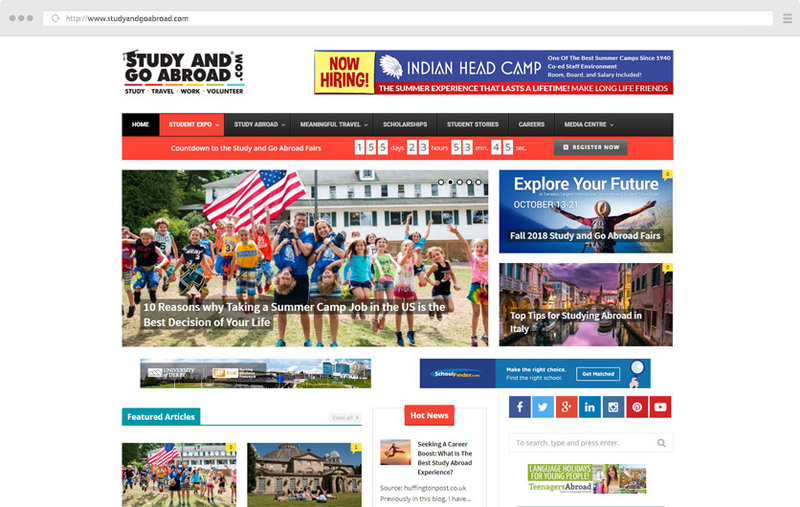 Feature articles and web banners on the home page are great for branding and ensuring that your institution is ‘top of mind’ for students looking for degree programs abroad. A wide range of web options are available – click here for more info. Ask us about combined web/social media packages.